Nice work! Layout looks very clean and organized. I like it. Are you interested to integrate your ui to a bigger admin system ? Most functions are ready to use. 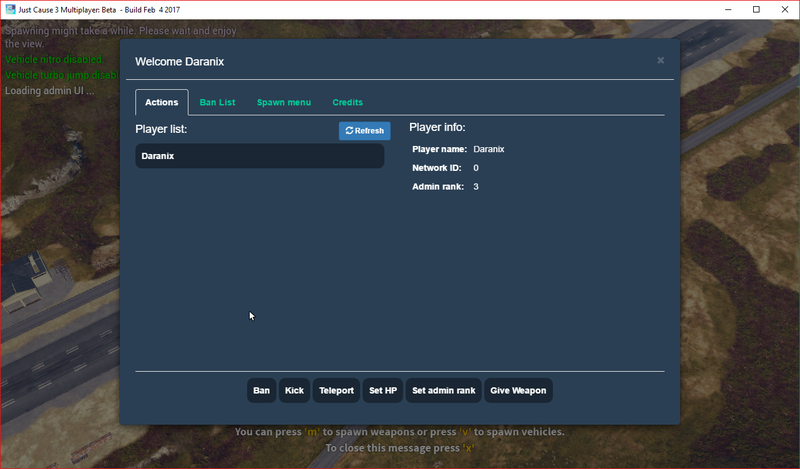 What is left is a ingame UI and the PI Webpanel. please write me a pn if you are interrested. For some odd reason I cannot connect to the Mongodb server. And the UI will not load. But the / commands work just fine! Yeah, the UI doesn't work for me either. I type /amenu and it says "Loading Admin UI" but then does nothing. I will try to release a new version before the steam release with choice of use a database or not and support for MySQL too. I used the npm install command to try and install the mongodb drivers. Why does the U.I. not come in the package rather than requiring a connection to a server? I'm new to JC3MP and server hosting. The UI is in the package but the UI only loads if the server can verify the user connected is an administrador, the server can't verify if the user is an administrator or not if no exists database, beacuse in the database is where is stored the administrators list aand well i know in the config.js was a list with administrator but i decided to check if exists a connection to the database first when i load the UI beacuse in the UI u can see the banlist and other things stored in the mongodb database. I hope I have explained correctly, however when you connect to the server, the console should throw an error, If you send me that error I can probably give you a solution to your problem. Okay. I'll let you know tomorrow evening. I'm currently not near the computer that has the server files on it. I plan on taking what I've learned from playing with the first server I tried making, and perfecting it in a second one. What would be fantastic is if you made a step-step video of how to install and get the package correctly running. The console says that it timed out while trying to connect to the Mongodb server. Im using mqsql for jcmp-admin-system but it keeps saying cannot find module 'mysql' any idea on how to fix this?